Please Scroll Down, To See The Entire Page. 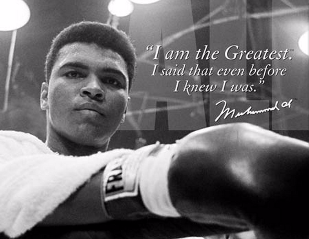 This Page is Dedicated to the late Great Muhammad Ali. 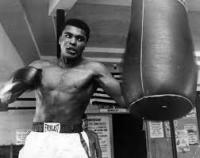 He was known for his Knockout Looks and his Knockout Punches. He shared his Great poetic lines with Fierce Confidence and Down to Earth Humor. He Touched so many people in the world, without even physically Touching them. He encouraged Many to Strive for Greatness through his dedication to his faith, through his dedication to family and friends, through is dedication to master his craft in boxing, and through his years of being a Great Humanitarian and a Great role model. 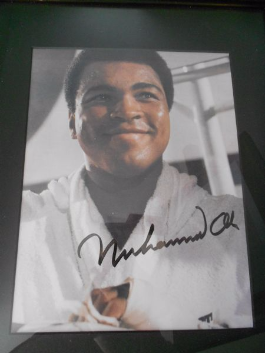 Plus, he was able to expand his mission through the Muhammad Ali Center. Which, brings in thousands of tourist, if not millions to view the different exibits at the Muhammad Ali Center. He's going to be missed and may the Great "Muhammad Ali" R.I.P. The poem below was written years ago, however it's a Great description of what he stood for as a man. The "Truth" wins the Fight over the "Lies". Your tongue flutters and flies. 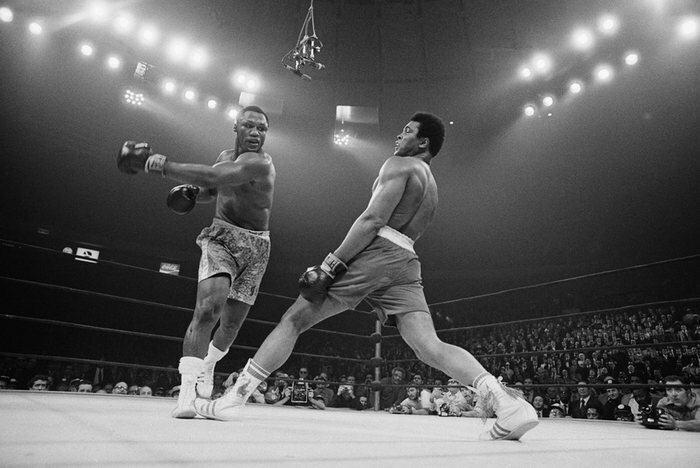 Float like a Butterfly, Sting like a bee, Guess what, you're No Muhammad Ali. Ducking and Weaving the truth again. Your not scared, of your committed sin. Swinging lies and combination proof. He gets knock out with the upper-cut truth. Laying flat on his back gathering his lies, it's too late bye bye. Ding, Ding the bell ring. Confused and hanging on the rope wing. The winner, the undefeated "Truth" has gloves of gold. While,the defeated "Lies" has lost his soul. 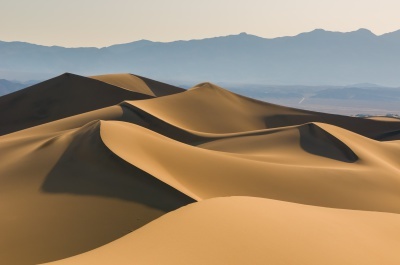 Click The Play Button To See The Slide Of Pictures. Different Videos For You to See. 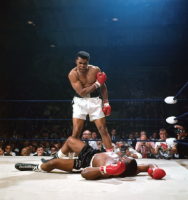 On this particular picture, it has that he started saying he was the greatest before he even knew he was the greatest. That's profound because with his confidence he drew that title to him. When people were able to witness his confidence in and out the ring and his God given abilities and skills, they knew was the worthy of that title. 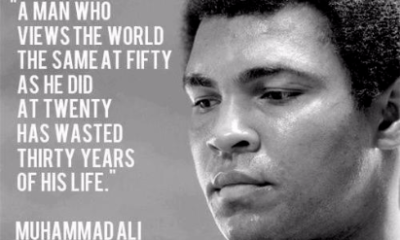 Muhammad Ali was a religious man, great boxer, Humanitarian, he was also a very wise man. He shared many great quotes over the years and this is one our families favorite. 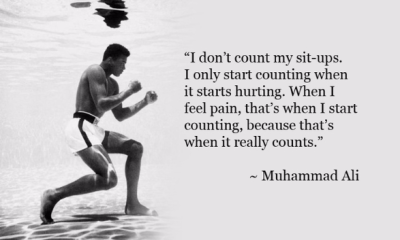 This is great example of Muhammad Ali having a great deep rooted amount of faith, desire and confidence. He didn't no how to swim at the time, however he told a sports photographer that he did a special boxing workout under water, so he could get that special publicity to take his boxing career to the next level. He took a hugh leap of faith, by believing that, even though, he didn't know how to swim, that his faith will carry him through. 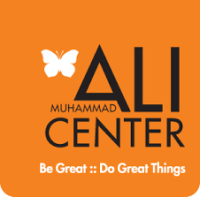 Click On One Of The Muhammad Ali Center Pictures To Go To His Website.